CHAPTER I. – A HAPPY HOME. The pretty little woman’s face got puckered all over with baby wrinkles, more suitable to the wee pink face that lay on her bosom than to her own somewhat pale one, as she made the remark. Further conversation was stopped by a knock at the door. “That’s some of them stayin’ away,” said Jerry, as he went out to open the door. As may be seen, Jerry and his wife expected company, the doubts as to whose arrival was caused by the extreme inclemency of the weather, and as the occasion of the festivities was an important one, the doubts were strong. Jerry O’Sullivan was a prosperous man in his line of life. His trade was that of a carpenter, and as he had, in addition to large practical skills and experience gained from unremitting toil, a considerable share of natural ability, was justly considered by his compeers to be the marking of a successful man. Three years before he had been married to his pretty little wife, whose sweet nature, and care for his comfort, and whose desire to perfect the cheerfulness of home, had not a little aided his success, and kept him on the straight path. If every wife understood the merits which a cheerful home has above all other places in the eyes of an ordinary man, there would be less brutality than there is amongst husbands, and less hardships and suffering amongst wives. The third child had just been christened, and some friends and relatives were expected to do honour to the occasion, and now the knock announced the first arrival. Whilst Jerry went to the door, Katey arranged the child’s garments so as to make him look as nice as possible, and also fixed her own dress, somewhat disturbed by maternal cares. In the meantime little Jerry flattened his nose against the window pane in a vain desire to see the appearance of the first arrival. Little Katey stood by him looking expectant as though her eyes were with her brother’s. Katey’s eyes were full of tears as she took him back, and she thanked the big man with a look too full of sacred feeling for even a smile. Jerry stood by in silence. He felt much, although he did not know what to say. Another knock was heard, and again Jerry’s services were required. This time there was a large influx, for three different bodies had joined just at the door. Much laughter was heard in the hall, and then they all entered. The body consisted of seven souls all told. 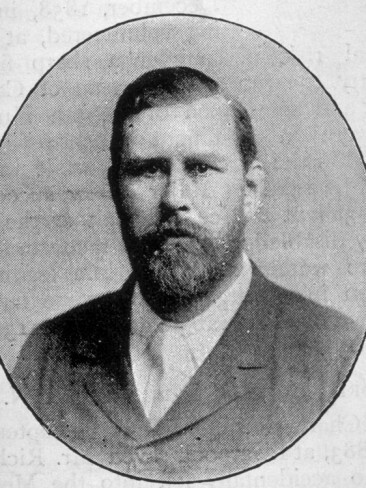 bramstoker.org is a website dedicated to promoting and sharing the work of Bram Stoker the author of Dracula. At bramstoker.org you can find free downloadable copies of most of Stoker’s writing.